Posted in Dental Health on April 4, 2013. Last modified on March 28, 2019. Read disclaimer. Though drinking water flouridation is not without controversy, most medical researchers agree that fluoride is safe and beneficial for dental health. They also agree, however, that more is NOT better. If you go beyond the relatively low amounts of fluoride recommended by the US Department of Health and Human Services, a number of health problems (both mild and serious, temporary and permanent) can occur. Because fluoride is one of the most common minerals on earth, present in the air (especially in areas that are polluted with industrial emissions), soil, rocks, and water, it can be found at some level in almost all foods. The tea plant (all true tea comes from the Camellia sinensis) is especially efficient at absorbing fluoride from the soil. In addition, many tea growers use fertilizers that contain additional fluoride. Although it can be high in caffeine, white tea is lowest in fluoride. That's because it's made from buds and very youngest leaves. 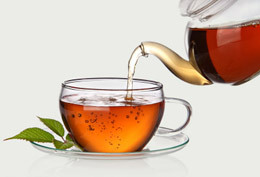 Limit your consumption of green, oolong or black tea to no more than 1 liter (slightly more than a US quart) per day. Of these, black tea is generally the highest in fluoride while high content of polyphenols in green tea are most frequently associated with health benefits. Avoid brick tea, which generally uses the oldest, lowest quality leaves. Not only can brick tea contains 2-4 times the fluoride of black or green tea, it's also lowest in health-supporting antioxidants. A paper by the Chemical Society of Ethiopia, for example, has determined that no sources of black tea from Ethiopia are safe for children and only 30% are safe for adult consumption. According to the World Health Organization, other areas generally high in fluoride include large parts of Africa, China (and northern Thailand), Middle East (Turkey, Iraq, Iran, Afghanistan, Pakistan) and Southern Asia (Sri Lanka and India). If you cross off all those options, what other countries are left?! Consider Japan, where quality control requirements may be higher. 3. Decaffeinated teas are generally lower in fluoride than traditional, caffeinated tea. 4. Powdered teas release more fluoride than do leaf teas. 5. Avoid using fluoridated water when brewing tea. In areas that have extremely high fluoride in their water, tea is so efficient at absorbing fluoride that the leaves can actually absorb rather than release fluoride. The four most common types of tea -- white, green, oolong and black -- all come from the same plant. (Herbal teas may or may not include true tea leaves.) The four types differ in how they are processed: White tea comes from the buds and youngest leaves, before they are even fully open. Both white and green tea leaves are steamed, soon after picking, in order to stop polyphenol oxidation. Both oolong and black tea leaves, on the other hand, are rolled in order to break their cellular structure. They are then allowed to oxidize (referred to as the fermentation process) before drying. Black tea leaves are allowed to ferment longer than oolong leaves. - Are fluoride toothpastes safe?